The subtitle translates as: My life as a Lied accompanist. The introduction is by Alfred Brendel. Does that make him a piano collaborator? I do not see anything wrong with the traditional nomenclature. The term “accompanist” is a concise and informative descriptor of the type of work involved, and its particular skills (notably, the ability to adapt, even when sight-reading, to what the other performer is doing, and give a performance that presents the other performer in the best possible light). As far as I am concerned, there is nothing pejorative about the term — those who think otherwise seem obsessed with the notion that supporting an interpretation that may have been determined principally by another performer were beneath their dignity (although, especially when there is plentiful rehearsal time, an accompanist can and should contribute to the formulation of an interpretation). Besides, even when following someone else’s initiative, there is still a dynamic of subtle “pushing back” at times, especially when it comes to handling rubato and fermatae, because this tension is sometimes the best means of obtaining the desired effect (in the same way that moving the body is made possible by the co-operation of *antagonistic* muscles), and it helps guard against excess in the heat of the moment. And let’s not forget that it’s a high compliment to call a conductor a skilled or sensitive accompanist. True, Bruce, but it would be no less so to call said conductor, e.g., Barbirolli, a skilled and sensitive collaborator. Heifetz, Rubinstein, et al., considered JB so. The best soloists and conductors will hope for collaboration, that in rehearsal the soloist will find a conductor happy to listen to the artist’s approach to the work, that the conductor will find an artist open to discussion on certain points. And both that the performance will be a resounding success. That is the essence of collaboration. Examples of performances where one can detect such collaboration are fairly plentiful: Arrau with Davis, Solomon with Beinum and with Jochum, Emmanuel Ax visibly so — he is one of those artists who approaches a concerto for piano and orchestra as he does any chamber music work, hence his attention to the conductor, but also to highlighted players in the orchestra. To my great pleasure, I find that Alice Sara Ott does the same, she an artist of such qualities and characteristics as I hardly dare hope to find in the younger generations. And Haskil…but this could be a long list. The list of ‘my way no matter what’ conductors and soloists would be a lot longer. Gerald Moore entitled one of his books of memoirs The Unashamed Accompanist, and in being an accompanist there is nothing to be ashamed, most surely. However, turn to Moore’s book The Schubert Song Cycles, and there it becomes apparent just what is involved, what qualities are necessary, what work must be done to be a good, let alone a great ‘accompanist’. The advantage that I see in the term Collaborative Pianist is that it makes plain that the role of the pianist is not secondary or subsidiary, and knowing that would enhance the enjoyment of many listeners, moving them to listen to both voice and instrument on equal terms. In a sense, more to listen to. There’s merit in that, for not just some singers but also instrumentalists see that role as secondary indeed. Jascha Heifetz did, always determined that the violin be to the fore, even when the pianist, in one recording of a Beethoven sonata for piano and violin, in that order according to B’s inscription, was Benno Moiseiwitsch. And very much ditto Itzhak Perlman with Samuel Sanders. If there is peril there, there is greater peril when it comes to singers. Are/were there great collaborative pianists? Certainly, and that being so, there must be more to the art than accompanying. I’m a good enough pianist to accompany a singer in Die Schone Mullerin, but the notion of my collaborating with a fine singer in a performance is risible. There is a difference. What’s in a title? I have almost finished reading this marvelous book by Helmut Deutsch. 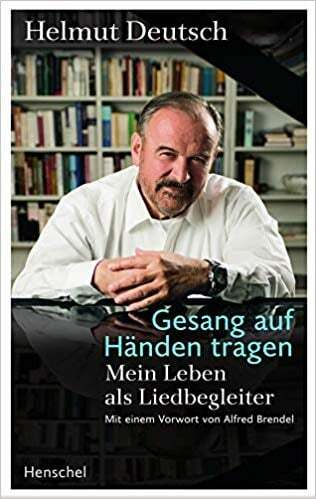 It offers great insights into his craft, not to mention detailed information on his work with Seefried, Prey, Kaufmann, Damrau, et al. On his website there is also a very enjoyable 45 minute documentary on his life and work. He is THE Liedbegleiter par excellence. The word “collaborator” has acquired such terribly negative connotations over the last several decades that for me personally the word “accompanist” sounds far more pleasant.